I’ll give you my new $599 course for $1.00! The Fastest Way to Make Money in Real Estate with No Money, Credit, Experience or License. Have you ever thought you’d like to buy and sell houses but didn’t know how or where to get the money or how to get started? Are you working so hard making a living you can’t take time to make any money? Is there more month than money? Do you often wonder what will happen if you can’t work anymore or simply don’t want to? Are your days boring, or job uninteresting, or your business sucking up your life and going nowhere? If you got fired or laid off today can you comfortably retire on your savings and enjoy life or will you have to work until they put you in the nursing home? It’s a myth. You don’t have to take years to get rich nor do you have to be old and worn out before you can retire. You can create a five figure monthly income within 90 days of starting and six figure annual retirement income within 18 months. It’s true and verifiable. Doesn’t matter where you live, how old you are, your financial stature, credit or experience… and there are hundreds of others in your city doing this same thing every day right under your nose. My name is Ron LeGrand, and I’ve bought and sold over 2,500 houses to date and still do today, and I’ve been making millionaires all over North America for over twenty-eight years now. For a limited time you can learn what I know for a total cost of one dollar. I call it the "Perfect Storm" because unusual chains of events have come together to create an economic climate for real estate entrepreneurs no one has seen before. The media is down playing real estate and convincing the public it's a bad thing. When the media says sell, I'm buying like a bat out of hell, and so should you. It's easier now than I've ever seen—people are throwing deals at us, and since we don't use our money or credit, there's no limit to how many we can buy! It's simple! If you don't take action now and get on the bandwagon, the greatest opportunity to create wealth on The Fast Track may pass you by before you even know what happened. You're about to get a chance to learn from the most qualified guy alive on how to get involved for a dollar. So, where does the dollar come in? Well, I was teaching a group of new students recently and decided to ask them what I could do that would be the biggest help to them. Of course, the overwhelming reply was "just give us the information for free". Obviously, that idea didn't sit well, because I've been selling what I know for over 28 years now and making a lot of people rich with what they've learned from me. I wracked my brain for weeks until this little idea hit me. I know you may have an interest in making money in real estate. I also know there are hoards of 'wannabes' out there who claim they know how to cash in on the current economy, but I want to make sure you have the opportunity to hear from the teachers' teacher. So as the "Godfather" of real estate investing, I'm going to make you an offer I hope you can't refuse! When people ask me how to get started quickly and make money fast, I always say wholesaling or flipping houses because you can be in and out in 15 to 30 days, and it's simple enough that a total beginner can start from scratch and get a check to help pay bills. Recently, I taped a brand new, step-by-step course designed for those who want to not only make some easy money now with the two million bank-owned properties currently on the market, but also build a job replacement vehicle so being employed becomes something you only do if you want to, not because you have to. You don't need to raise money, hire contractors, get a loan, deal with picky buyers or even buy a house. Your credit is irrelevant, and you need no previous experience. I currently have thousands of students flipping houses and many doing so in their first month with what I teach in this course. Steps of finding a bargain house and quickly flipping it to a bargain hunter for a minimum, hassle free profit of $10,000 in thirty days. Finding deals from your home and estimating repairs in minutes. Determining market value in a recession in a few minutes at your desk. My formula for what to offer adjusted to today's reality. You'd better know this, or it's painful. How to find Realtors who'll do most of the work at no cost and help you get the best deals. Building a big buyers list overnight so selling becomes the easiest part of the business, and it's all online. A $25,000 a month plan over the first 90 days to help you ditch your job, if it hasn't already ditched you. 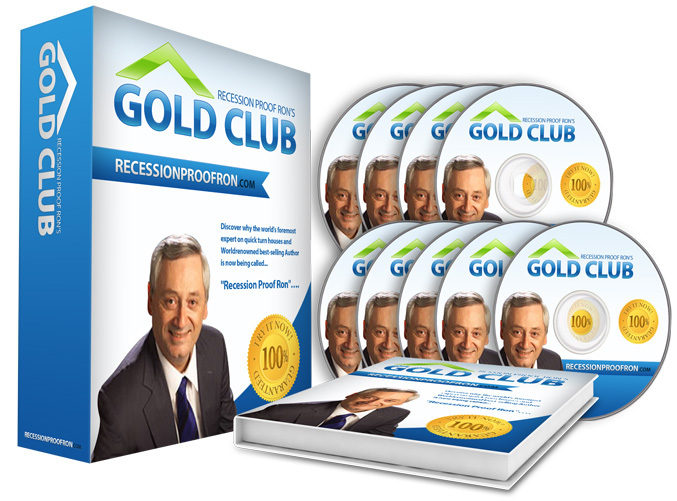 Numerous vital secrets I picked up in 33 years of wholesaling and 28 years of teaching it. A step-by-step written plan to follow assuming you've had no previous experience. Where does money come from? Where does it go? Who makes it? The money magicians' secrets are unveiled in the birth of our Federal Reserve system. This one will scare you when you see what's really backing up our treasury. George Ross, top Advisor and Senior Counsel to Donald Trump interviews me and asks some tough questions and discloses some behind the scenes secrets of the Trump organization. Hot Tips From Me - My Mentors and advisors. I hang around with mega-millionaires and billionaires. One idea here could change your entire future. Hot Websites - Our research team uncovers those we feel of value to you in your business and personal life. A full time staff will devote hundreds of hours sifting through the crap to dig up the best discoveries. Resources - We uncover to help you get more done with less work to make more money. Weekly Video Lessons - I cram a one hour lesson on the most demanded subjects into a ten minure video wach work along with a video Q & A from the questions you submit. You'll receive a certificate to use when you're ready to call my qualified counselors to discuss your personal situation, one on one. Here's where you can discuss your game plan, how to get out of your job, your roadblocks and personal issues, how to get started, realistic expectations, what training is available, ongoing personal mentoring and anything else on your mind. This is a $75 value I'm adding at no cost. Private Lender Website: Attract, pre-screen, and drop private lenders right in your lap! Here's where we've done the work to attract people to lend you money to pay cash for houses and there's nothing for you to do but send some traffic to your own personalized site and respond to the inquiries as they come in. Forms and Agreement Library: You need an agreement or form to do almost anything in real estate and business, and all of Ron's copywrited agreements and many more are all here ready for you to fill in the blanks or send to your attorney. Thousands in legal fees went into these agreements along with 33 years of practiced experience. Regularly updated by the Gold Club team, you'll find U.S. and Canadian coverage as well as copyrighted agreements, which are separated from the rest in a category of their own. Gold Club Member Forum: An ongoing social environment where you can communicate with members and teach what you know while learning from other players in real estate and business. "Ask Ron" Discussion Forum: Your pipeline to Ron LeGrand and the most knowledgeable members on his team, "Ask Ron" welcomes your direct questions on issues that you need help with. 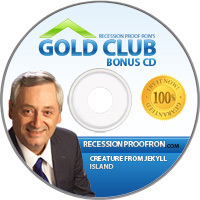 Special lessons and articles personally written by Ron LeGrand: Various topics, including wealth creation, business growth, asset protection, new income streams, lessons learned, new discoveries, insider stories, actual deals done and a recurring series called, "If I Were President." In his "What Would Ron Do? "column, Ron LeGrand tackles your real estate and wealth building questions every month. A BONUS TRAINING CD: At least 6 CDS per year are delivered to your door with your Mentor Newsletter packet. Ron interviews the best of the best at your request and also uses the CD to deliver new seminar topics, webinar recordings, or featured HOT topics from his training course packages. Meet The Team, Success Stories, Interviews, And So Much More! 3. Webinars & Events: Calendar and mailings -. Ron does frequent educational and event coordinated webinars on his own and with leaders throughout the industry. Our single and multi-day training events, held in both the United States and Canada, and often available via live streaming, run the gamut from real estate school to online wealth building. 4. Gold Club Member – Affiliate: The first thing Gold Club members should do is take advantage of the rewards that can come your way as a Gold Club Affiliate. We'll show you how to refer new members to the Gold Club using your own affiliate link, generating yourself $25 a month for each new member in good standing you send our way. You'll also be invited to promote our live and online training events and products through your website, emails, Twitter, Facebook and other media, passing along your affiliate link that will automatically credit you with each new registration delivered and pay you a hefty commission. Being an affiliate COSTS NOTHING, pays you money for successful referrals, why wouldn't you want to be a Gold Club member??? This one benefit can easily pay for the membership and could replace your current income. Use it and you get paid to be a member. OK, Ron. Why Are You Giving Me So Much For Only $1.00? The answer is simple. It's a shameless bribe to get you to try out my new Gold Club membership and give us the chance to show you how valuable it will be to you. Do you remember AOL's business model when they started? I bet you can remember getting several CDs in the mail over a few years with good offers to get you to try them. Well, they lost a fortune to build a customer base but no one is feeling sorry for them now. Same here. We'll lose our shirt in the beginning, but we'll have the strength of thousands of members and that strength will benefit you in many ways. Think of AAA, AARP, NRA, Costco to name a few. Numbers equal volume, volume equals value to you and it will only increase as we grow. Sorry, this Gold Club doesn't include naked ladies and lap dances, it's not that kind of club, but I've always liked the name and I think it's perfect for this elite group. Give us a chance and we'll show you how much value we can cram in a whole month for a measly $59 as should be evidenced by my $1.00 offer. I promise you will be so impressed you'll want to tell everyone you know. Of course, that's exactly what I'm counting on to reach my member goal by year end. If you don't agree the value is there, you may opt out anytime and keep everything here. We'll send you a new member package in the mail immediately, and after getting all the facts, you can decide if you'd like to remain as a member. No obligation, and no one will be calling you or harassing you to do anything you don't want to. The only catch is I don't want people just paying $1 for my course, and then canceling the next day. I'm giving you a full 30-day trial, so use it. You must remain a member for at least 2 weeks before canceling. You can cancel any time after the first 2 weeks and you will no longer be charged. Is that fair? At the very least, you'll get my new real estate course worth $599 for only a buck, and you can use that to net $10,000 very quickly. This should be an easy decision for you. Take me up on my crazy offer. To Make Money With Social Career Placement And Share Your Story! "Using Ron's system, I found a small bungalow in Cleveland. I worked out the formula and was ready to offer $85,000. My coach convinced me to make an offer in the low 70's. I was afraid to make such a low offer thinking I would lose the deal. I finally offered $73,900 and the owner accepted, which meant he may have taken even less. Just that one bit of advise netted me an extra $11,000 on my first deal. The check I received was for $20,543.55. What I learned on my first purchase was more valuable to me than what I learned in college. Sitting in a classroom, you only learn the theory. After the learning, you have to take action. Every situation is different, and I made a lot of mistakes on my first house, but it is a part of continuing education. An ounce of action is worth more than a ton of theory. I ended up quitting my job last year, and I am now a full-time investor, so failure is not an option. This opportunity has freed up a lot of time. I spend more quality time with my friends and family. Thanks for giving me the tools and courage to quit my job. I should have done it 20 years ago. I currently own a house in Columbus, OH that is for sale, and I just had 2 properties deeded to me this week. My goal for this year is to buy a minimum of 24 houses." • On Feb 1, we closed our first short sale. We wholesaled it to another investor and netted $10,000. • We have 5 other short sales in the works. • We have the deeds to (2) "subject to" houses, which we will be taking over soon. • We have 1 other wholesale deal in the works, which will net us $5,000. • We closed Jan 30 on a rehab we completed and sold that will net us $25,000. We have 2 rehabs for sale now, 3 that are almost finished and ready to sell and 2 more under contract to purchase in Feb.
• On one of the rehabs, a person called on our "houses wanted" ad. We bought the house for $22,000, the value is $135,000. We will net over $65,000 on the deal. From the previous deals, we will net somewhere between $400,000 and $500,000! Our goal is $1,000,000 in net profit. We are so excited about this business, Ron, and thank you for your tools and programs to help us succeed." "It got cold in Michigan, so we moved to Orlando, FL last year. Now we can go back and forth from Sunny Florida to our Waterfront Vacation Home on Lake Huron in Michigan that we took "subject to" with a whopping $250.00 down. That's right $250.00 for a beautiful Lakefront home taken "subject to" just like you taught us. Here are the numbers: the after repaired value is $250,000, repairs $2,000 (paint and new light fixtures) taken "subject to" for $158,900. Seller had 3 house payments and was very motivated. Sounds like $90,000 worth of equity to me, Ron, and a vacation home we can pass on to our kids. Thanks, Ron. No credit checks or guaranteeing the debt. Simple, just like you taught us. Every home we have purchased was no money down, very little down or they paid us to take the house, just like you taught us. When you see the view, Ron, it's like living on the ocean, except it is fresh water and they have fish there too. If people would just listen to more of Ron instead of the Morons, they would learn. We sound like you, Ron, the more of your words that come out of our mouths the more money, we make. Can you imagine that? We would advise anyone who wants to get into real estate investing to get Ron's training as fast as you can. Beg, borrow or steal the money, nope, forget the stealing part, just get the training as fast as you can before Ron decides to retire and go fishing forever. Thanks again, Ron, for taking the time to share your life with others." "It's hard to believe that only 9 months ago, I was a dog groomer. Then I got your training, Ron. I got a house under an option for $590,000 and sold it for $660,000 for a profit of $70,000. This is after the house had been listed with a realtor for over a year, for $649,000 and it had not sold. Everyone says the market is soft and it's next to impossible to sell houses right now, but they just don't know the "secrets" I've learned from your training. This soft "buyers'" market makes it easy to buy houses at a steal and then sell them near or above full retail using the right methods. I hope this market keeps getting worse! You have proven that with the right training, you can make tons of money in real estate no matter what the market is doing. Someone else grooms my dogs now and, thanks to you, I now drive a convertible Mercedes, and last week, I bought not one, but two boats. I can't thank you enough – you've changed my life forever! P.S. I thought I should also mention a big problem you have created for me. I decided I should only date men who make at least as much as I do, so they can afford the nice places I can, so I don't have to pay all the time. The problem is, not only does that narrow the dating pool down to almost nothing, but every week that goes by, I make more and more money, so the dating pool gets smaller and smaller. At the rate I'm going, I'm afraid I'm going to die alone. My only hope is to meet another one of your successful trainees! Fix me up." "I served 7 years in the military (USAF) and I proudly served in Desert Storm and Desert Watch, before I received my first training with you, Ron. From that day forth, my life was changed, and I knew right away that this was what I was meant to do in my lifetime. I have been working 3 jobs since I was 18 which all I knew how to do in order to succeed in life since that is what conventional wisdom tells you to do, and that got me nowhere but tired and broke. After your training, I immediately quit all 3 of my jobs even though I was broke and demanded that the USAF let me go and I was released with an honorable discharge 3 days later. I want to thank you once again for all that you have done for me because I will never forget where I came from and how broke I was even with three jobs." "The courses I purchased have really changed my life. I no longer work to pay someone else's bills. So far in two months, I've worked just about every deal explained in your courses, and my income has skyrocketed! Your courses are very thorough and self-explanatory leaving little to the imagination. I just want to thank you Ron for putting together such a dynamic course." "I cannot find the right words to say thank you for the way you have changed my life. I am a new student of one year and having the time of my life with my new career. I could not have done this with out you. There is no doubt in my mind you are definitely the man with a plan and I will be following in your footsteps." "What we learned will propel our business again to a much higher level. This event is a must for anyone that wants to improve cash flow. We got one idea that will increase our cash flow by more than most people will make in the next 10 years!" "Ron has a common sense approach that makes what he teaches applicable when we return home. Ron's willingness to share his experience & knowledgeable has changed our lives. He could have continued to do what he was doing and never shared with us, but he didn't." "Ron, You have done it again! You're easy to understand instruction really simplified what was a very complicated exclusive niche. It opened up a whole new world of explosive revenue. I am excited the likes I haven't felt in years. Thank you and I look forward to splitting multi-million dollar deals with you soon." "Very well organized and valuable class presented in an honest and straight-forward manner. The analysis of the actual deals, both Ron's deals and students, with no punches pulled pointing out mistakes was excellent. I would highly recommend this class." "This event was life and mind altering. My vision for my future has changed dramatically. I have a new vision as to my income-producing capability and my mental earning ceiling was shattered as it sky rocketed upward. It was absolutely fantastic. I learned things that will change my life. Thank you." AND IS SAFE FROM UNAUTHORIZED ACCESS.